One of the perks of my job is that I get to see some pretty amazing paper promotions. Over the years I’ve amassed quite a collection of fab samples showcasing every print technique imaginable. I refer to my sample library often, especially when a designer asks to see something special. The one area of my stash that is in hot demand these days is luxury packaging. It seems everyone with a new business or product is embracing the tactile medium of paper as a means of differentiating their brand.There’s tons of great info online about haptics (the science of touch), but to me there is nothing quite like experiencing the real thing. I always thought it would make so much sense to just have one really well executed packaging piece that highlights paper as an essential part of packaging design. 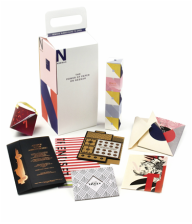 So when I opened the new Neenah packaging promotion - The Power of Paper: On Neenah, I almost passed out. Upon the box unveiling, I am greeted with a fab little packaging sample for a fictitious fragrance, ONIT eau de perfume (get it?) produced on Eames Solar White Canvas 120#DTC printed with five PMS colors + black featuring a copper foil - LOVE, LOVE, LOVE IT!! As if that wasn’t enough of a presentation, it’s propped up on a box holder and back drop made out of Starwhite Tiara 130#DTC Vellum featuring a blind emboss. Oh and all of this sits inside an insert on Neenah’s Folding Board Deep Black in 18PT. At this point I stopped processing all other stimuli - I was on complete sensory overload. ON LINE - a petite hangtag, smartly die-cut showcasing two Classic Linen shades and sporting a foil stamp & ribbon loop. ON DEMAND - reinforcing the power of paper as a haptic delight, featuring a cute little folding box on Environment Grocer Kraft 100#C, resembling an oven paired with a sweet recipe card featuring chocolate scented ink printed on Stardream Silver 105#C. ON TREND - a fun little trend brief touting the power of paper in mixed media campaigns featuring Esse Pearlized White 84#C and Eames Vellum Solar White 100#T sporting a lot of ink. ON TARGET - demonstrating the power of paper yet again with stats from direct mail campaigns printed on Starwhite Natural 80#C inside a sweet little 6 Bar envelope. ON TIME - emphasizing Neenah’s paper availability this is a great example of a stunning holographic copper foil on Classic Crest Epic Black 130#DTC. ON POINT - illustrating the importance of the unveiling process, this a fab little sample of a gift card holder + gift card. Yes, Neenah has a product that can be used as an actual gift card - Neenah Paper Card! The sleeve features silver metallic on Classic Crest Avalanche White Stipple 100#C with die-cuts and houses ImageMax card PC 40 White 28 PT. (super thick) sporting gorgeous white pearl &amp; black foils. ON PAPER - highlighting the tactile importance of paper and its magical powers, this sample on Stardream Coral 81#T sports begged to be touched red flocking. ON PRODUCTION - because all of these details are just too much for any one to remember precisely, they’ve made it super easy with a handy little 4 page card detailing all the production notes. Designed by the team at Design Army in Washington D.C., Neenah has produced the mother of all mill promotions. This one is in pretty limited availability, so if you’re involved in a packaging project hunt down your Neenah rep and beg them for this sample. In the meantime, keep collecting those print samples - you never know when you'll land that dream project and have just the perfect technique in mind for it.